There it is again, this week. The outrageous ad in The Economist, thinly veiled as a job posting. I had not seen it for a few weeks and hoped it would be gone. But no, it keeps coming back. Personally, I always found it a bit ugly that The Economist would sell space to a company that provides “a wide range of asset protection trusts, private interest foundations (…) in countries such as Li[e]chtenstein, Panama and Switzerland (…) limiting exposure to income, corporate, inheritance and capital gains taxes (…).” In other words, that helps rich people to escape taxes using secrecy jurisdictions. However, those were small ads that looked somewhat dodgy, tucked away in the Business & Personal section near the back of the magazine. You won’t find them in current editions anymore. Perhaps that’s because of the OECD’s crackdown on tax evasion. This month, for the first time ever, 49 countries including Liechtenstein will exchange data about bank accounts owned by foreigners. In September 2018, more countries including Panama and Switzerland will follow. Although the OECD system has serious loopholes and doesn’t serve many developing countries, most of the old tricks to hide money offshore will soon become useless. However, offshore financial centres have shown remarkable resilience, as The Economist itself already noted in its February 2013 special report on offshore finance. 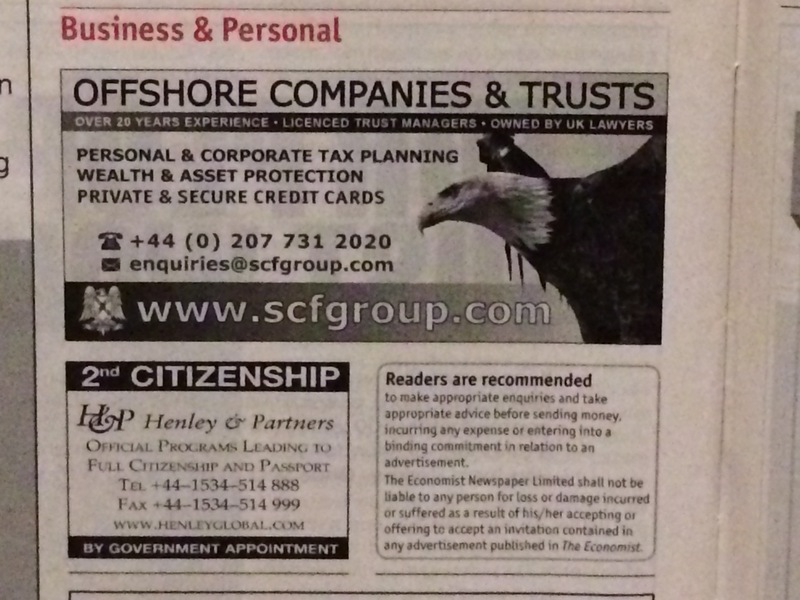 The SCF Group ad pictured above is from the magazine including that special report. As if that isn’t ironic enough, now look at the bottom of the picture. 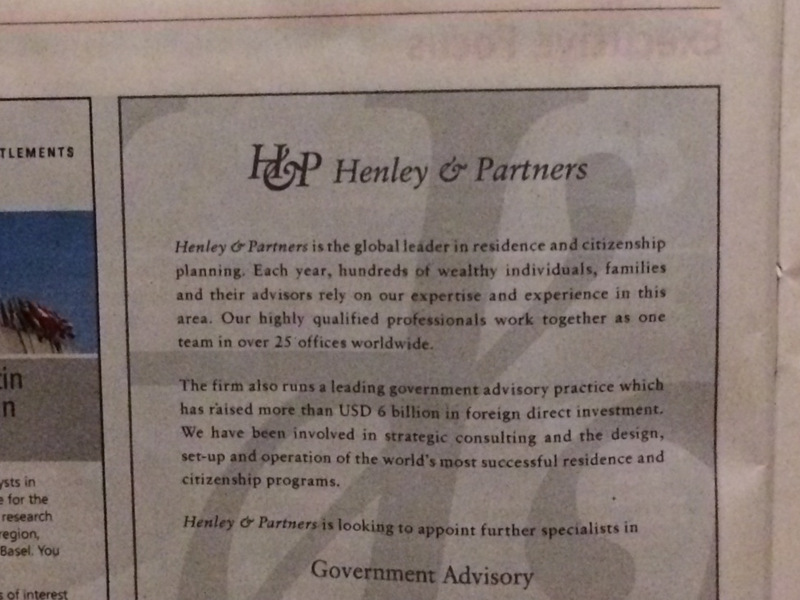 There’s another ad, by Henley & Partners, offering 2nd citizenship programmes. Such programmes could be the super-rich’s next big escape from taxes. Imagine you’re a multi-millionaire determined to hide your money. Annoyingly, other countries start identifying your bank accounts, looking right through the layers of shell companies and trusts set up to disguise that you are the real owner, and automatically report your wealth to the tax authority in your home country. What do you do? Right – you try to officially become resident of a tax haven instead. That’s where the 2nd citizenship programmes come in. If you wondered why that nice article, defending political rights, referred to taxes, it’s because the super-rich may use dual citizenship to dodge tax. This is completely different from the small, dodgy ad four years ago. It is much bigger, looks sophisticated and is readily noticed, in the Executive Focus section right after the main articles. It comes as a job posting, they’ve advertised dozens of jobs over the past two years. The vacancies may be real, yet the ad clearly aims to promote H&P services. Henley & Partners hint that some further planning may be required: “Even after a client has become resident in another country for income-tax purposes, he may still be considered domiciled in the previous country of residence for inheritance and gift-tax purposes.” No doubt they offer a solution for that too. To their credit, they emphasize that “a client should never be advised to relocate mainly for tax reasons.” That warning has nothing to do with ethics, but if a filthy rich person merely pretends to live abroad, the tax authority may find out and still go after him (or, less likely, after her). Their website also boosts citizenship-by-investments programmes. Visa free travel to 135 countries? 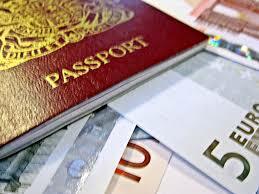 Buy a property on the beautiful Caribbean island of Antigua and get your 2nd passport. For new residents, there’s a tax benefit too: personal income tax was abolished in 2016. Now, there’s something peculiar about this programme. It was designed by H&P! For that’s their second line of business, advising governments on special regimes to attract rich people. That’s smart, isn’t it? First they get paid by governments to create loopholes in the global tax system, then they get paid by multi-millionaires looking for such loopholes. Such dual consulting makes it hard to sustain that advisors are not to blame for tax dodging, because they would merely advise about the use of existing legal options, but who cares? It’s just good business. Citizenship and residence are not the same, though. Even if you buy a nice villa in a resilient tax haven with a citizenship-by-investment programme, your income may still be taxable in your original home country if you continue living there. But what if you would open a bank account using your 2nd passport and tax haven address, and forget to mention that the other country still sees you as a resident for tax purposes? Would the bank find out? If yes, you’re in trouble. If not – or worse, if the bank turns a blind eye – the account only gets reported to the tax haven authorities and you’ve successfully cheated the OECD system. Let’s hope that the OECD people, who no doubt read The Economist, have spotted the regular warning sign kindly posted by Henley & Partners.